The wild sunflower is the non-cultivated cousin of the sunflower and it has showy ray petals which attract birds and butterflies. Interestingly, the leaves are phototropic; they turn to follow the sun therefore increasing the amount of light and leads to increased photosynthesis. This adaptation occurred because the sunflower’s primary source of nutrition is from conducting photosynthesis. 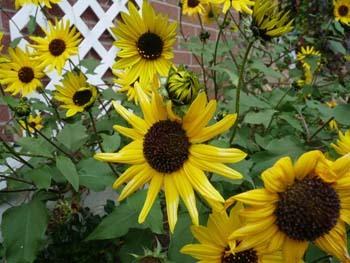 The wild sunflower is considered a noxious weed in many areas across Canada and in several U.S. states. Wild sunflowers are native to North America and were naturalized in Europe in the XVI century. Distinguishing Features: Wild sunflowers are coarse, hairy, leafy, fast-growing annual plants that typically grow to a height of 1 to 1.5 metres high and have stiff upright stalks. The species is considered a weedy plant because it is commonly seen growing along roads, fences, fields and in waste areas. The flowers resemble the daisy and have a central disk of florets that have yellow ray florets surrounding them. Flowers: The sunflower heads can measure up to 13 cm across and they have yellow, pleated rays and a red-brown central disk. The flower heads are daisy-like and they consist of numerous central disk florets that are yellow to brown; they are surrounded by approximately 20-40 ray florets. Flowers bloom between July and September. Fields of Nutrition has medicinal benefits and vitamin/mineral content of Sunflower. 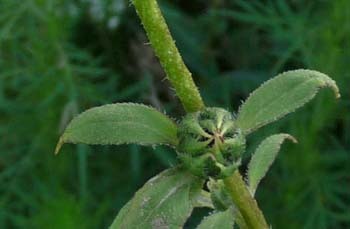 Leaves: Wild sunflower leaves have a rough, scratchy texture and are lance-ovate, egg-shaped, or heart-shaped, and can measure up to 30 cm long. The leaves are alternate ad both the leaves and stems have course hairs. The upper surface of the leaves is dull green and covered with short stiff hairs, giving it a sandpaper-like feel. The petioles are light green to reddish green, and covered with short stiff hairs; the upper surface of each petiole is channeled. 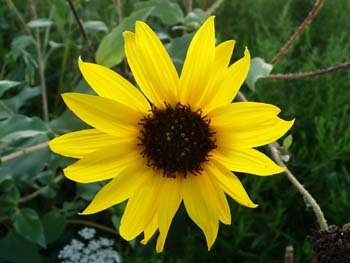 Height: Wild sunflowers grow to an average height of between one and two metres. Habitat: The wild sunflower habitat is primarily the prairies as well as dry, open areas. It grows along roadsides, in fields, along desert washes, and in grassy areas. It grows best in sunny, moist, or disturbed areas. The wild sunflower is tolerant of high and low temperatures, although more tolerant to low temperatures with the optimum temperature range being between 21 and 26 degrees Celsius. It thrives in alkaline soil and is somewhat drought resistant. Edible parts: The seeds are the typical edible sunflower seeds, but the wild sunflower seeds are very small, unlike the cultivated varieties used for commercial seed production. They can be consumed raw or cooked. (Seeds ripen from Sep to October.) Rich in fats, the seed can be ground into a powder and mixed with cereal flours to make nutritious bread. Seeds can be used for spouting and eaten as soon as they sprout. Young flower buds can be steamed and served like globe artichokes. The leaf petioles can be boiled and mixed in with other vegetables. Flower petals, leaves and roots can be used to make tea.